TD Jakes Ministries | Your restoration starts today! | Monthly TV Offer – September 2018 – Be Restored! God loves you so much that He will help you learn from your experiences and seize the next opportunity. It’s time to discover the part you play. He wants to realize an opportunity you may have overlooked and learn how your mess became your miracle. The God of Second Chances 3-part series on CD. 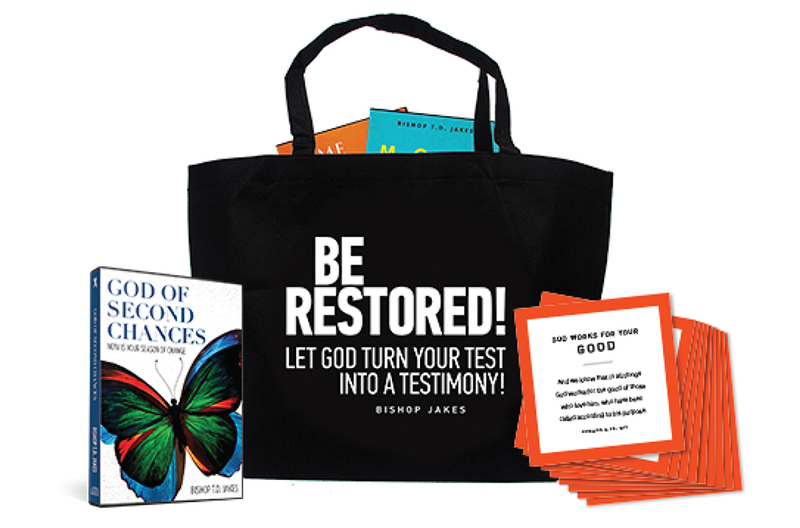 God of Second Chances plus The Restored Collection, which includes a beautiful custom bag, a set of restoration promise cards, and bonus resources that will fuel your faith and feed your spirit. Remember God’s mercy is new every morning. Take hold of your second chance today! You can find restoration, healing, hope and freedom today. No devil can stand in the way of the work God is ready to do in your life. Seize your second chance today and let your restoration begin.